The School of Computer Science has close links to various research institutes and centres. Research at the interface between chemistry and biology is carried out in the MIB, which brings together researchers from a range of disciplines addressing challenges in industrial biotechnology, healthcare and energy. World-leading research into graphene will take place in the new £61 million NGI, due to be completed in 2015. The 7,600 square metre building will house state-of-the-art facilities, including two 'cleanrooms' where scientists can carry out experiments and research without contamination. Research into informatics for public health benefit, where computer science and medicine come together in collaboration with centres of excellence in related academia, the NHS and industry in the Northwest Region of England. Six centres make up the institute so that expertise from the University in population health and health sciences can be used to improve the health and wellbeing for people locally, nationally and internationally. Research into nanotechnology takes place at the CMN, with a wide range of facilities specially designed for advanced multidisciplinary research, and for the fabrication, visualisation and characterisation of nano-structures and devices. Expertise in text mining is available through NaCTeM, allowing researchers to exploit large volumes of research data that might otherwise be overlooked, through 'natural language processing' and parallel and distributed data mining systems. A broad range of disciplines from across the University are brought together by Mi into multidisciplinary communities focussing on major application areas such as mobile health and social care and the digital economy. Researching new ways of harnessing electronic health data to improve care for patients and communities. Partners from academia, the NHS, local authorities and industry combine clinical, social and research data, aiming to identify more effective treatments, improve drug safety, assess risks to public health and study the causes of diseases and disability. Clinical researchers work with computer scientists, physicists and chemists to develop and apply cutting edge imaging and computational techniques for the understanding of disease, its management and treatment. An informatics research and e-Health innovation hub, with research focused on computational thinking with respect to the health of populations. A federation, which interconnects Manchester's existing research activity and research partnerships, offers huge potential and opportunities and will generate health benefits, economic development, enterprise, innovation and wealth creation in Greater Manchester and the wider North West. The Manchester Centre for Integrative Systems Biology (MCISB) at the University of Manchester has been awarded £6.4M by the BBSRC and EPSRC to pioneer the development of new experimental and computational technologies in Systems Biology, and their exploitation. 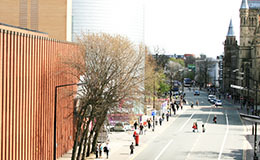 CCSR is an interdisciplinary research centre in the School of Social Sciences at the University of Manchester. CCSR is closely aligned with the discipline area of Social Statistics and has close links with the Institute for Social Change.